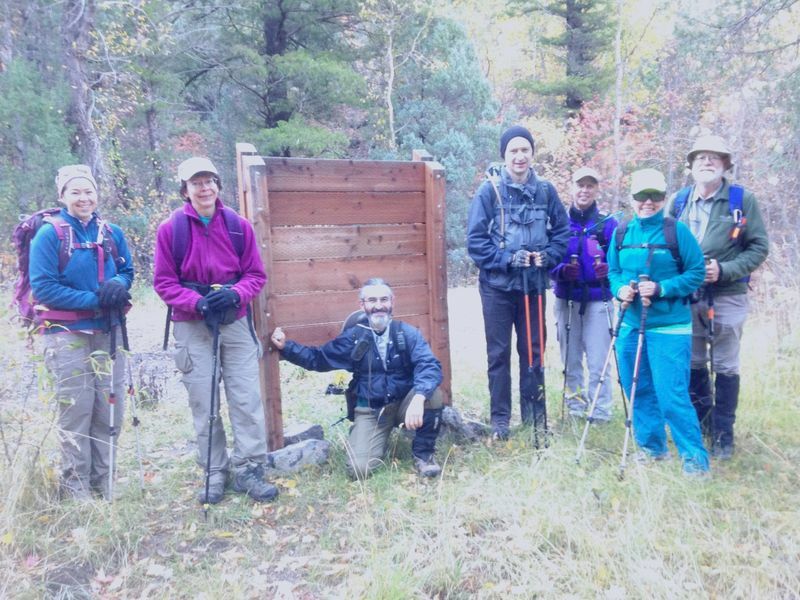 Eight people rendezvoused at 8 a.m. for an exploratory hike up Cottonwood Canyon: Stephanie, Denis, Dave W, Jane, Laurel, Nikolai, Kathy, and Dave P. We had heard of an unmarked trail going up the Canyon, but none of us had traversed it. Stephanie had been up as far as the turn off to a trail that goes up to the Jardine Juniper from the east. We followed the canyon trail, which had a few steep or narrow sections and a bit of knee-high vegetation, but it was basically in good shape. It was a glorious fall day with lots of color; a bit cool at the start and even a few spots of frost. The peaks were white with recent snow and a layer of snow covered the ground in some areas. On the trail the precipitation left some areas muddy, and trail-side plants soaked our pants below the knees. The canyon has steep cliffs on both sides. The lower canyon had water in the creek, but most of the stream bed was dry with cobbles that indicate intermittent flow. 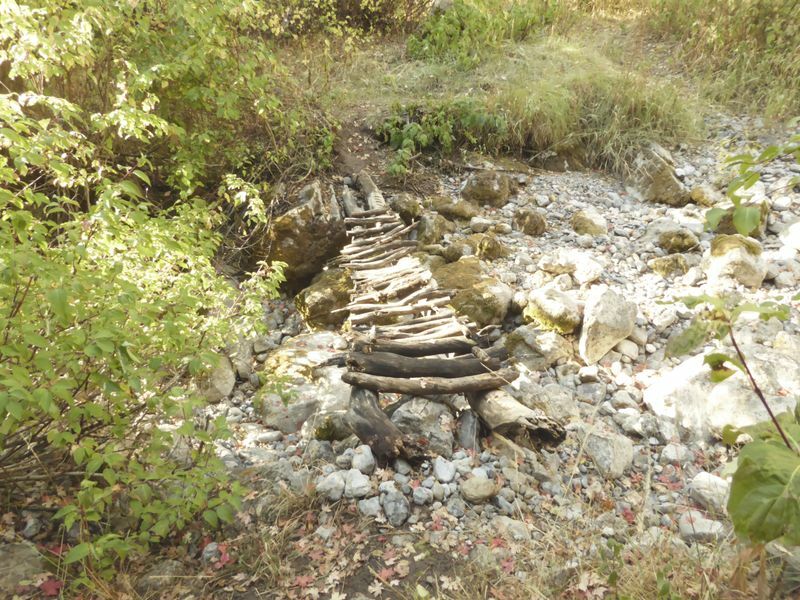 Several log bridges had been made to cross the drainage when necessary. 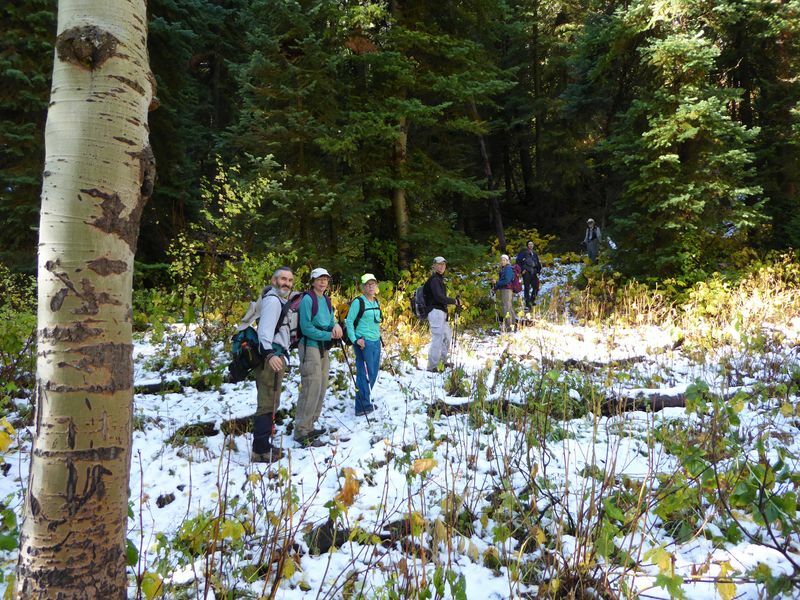 We followed the trail up the north fork of Cottonwood Canyon to the intersection with the Cottonwood Trail (048) that some of us were familiar with. We hiked south on this trail to the ridge between the north fork and the west fork where we stopped for lunch at 11 am. We could look south across the South Fork of Cottonwood Canyon to where the Jardine Juniper Trail traverses the ridge above “the bench”. Northward we could look up the north fork to the Naomi Peak ridge. Eastward we could look down Cottonwood Canyon to the other side of the highway and the Mud Flat area. We went back the way we came, with a short detour to look through a rock portal into the South Fork, which was full of brush and boulders. 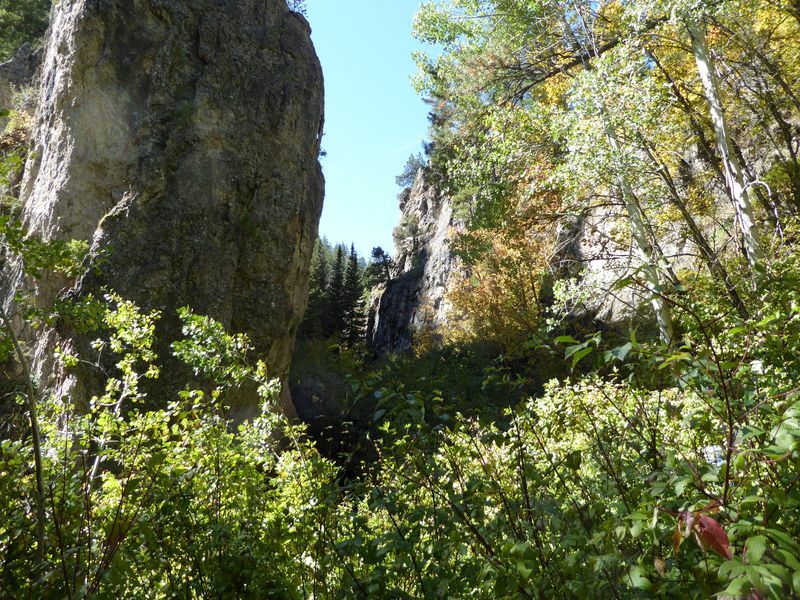 Editor's Note: This portion of the Cottonwood Canyon Trail has been abandoned by the Forest Service and no longer appears as one of their system trails. It was last described in the 1994 edition of Cache Trails as "not maintained", a "real challenge", "waist-high vegetation" and "impassible at times of high water", and the trail was omitted from the Cache Trails 2004 edition. Recently, however, individuals have done a lot of work on the trail, clearing vegetation, building "bridges" and improving the tread. While the original trail may have either climbed steeply up to the Jardine Juniper trail (USGS 1969 Mt. Elmer Quadrangle) or up the South Fork of Cottonwood Canyon (1994 Cache Trails description), the current trail follows the main canyon until it climbs to join the Cottonwood Canyon trail (Trail 048). Thanks to Dave P. for the narrative and photos and Dave W. for photos and GPS work.